This is the tale of two pipes. One is a venerable Custom-Bilt given to me years ago by a dear friend who is now gone. The other is a "Custom Bill," named for the spirit of the North American Society of Pipe Collectors quarterly and a devotee of Custom-Bilt pipes. Bill Unger, who died in 2013, was an authority of Tracy Mincer Custom-Bilt pipes. And he even wrote the book on the Mincer Custom-Bilt. Not just a book, but The Book! Like everything he did, from his bushy head and frizzy beard to his writing, it was authoritative, distinctive, a man you never forgot his first impression upon you. Some classified Bill Unger as hippie in appearance. Well, maybe. I’ve learned those who look a touch oddly-turned just might be part of a group who think. . .. a lot. 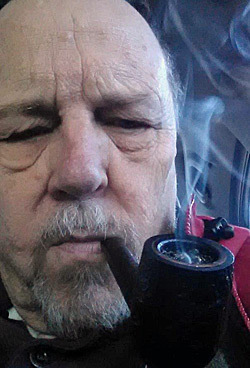 Bill Unger, Ph.D. in English, and the world, smoked a pipe from "dawn to dusk," he once said. That makes him a member of the mind workers of the world, pipe smokers. The book on the odd, but very smokable pipes, is titled, As Individual as a Thumbprint: The Custom-Bilt Pipe Story. But let me back up to the beginning. Clark Porteous, one of the South’s legendary newspaper men, and a pipe smoker, was on the Memphis Press-Scimitar when through some quirk of fate or blind muse I was hired as a general assignment reporter. Clark was one of three white reporters who had covered the murder trial of Emmett Till in 1955. Till, 14, a black youth was murdered after an alleged offense toward a white woman in a small Mississippi delta town. The trial was a tense affair, especially after witnesses to the murder were uncovered. They worked on "plantations" around the area. In the late 1970s when I edited a small Arkansas daily newspaper, many of the large rice and soybean farms were still known as plantations in the dark delta land. After short deliberation, the jury set Till’s killers free, all acquitted. Clark was called a hero of the trial since he interceded on the part of the witnesses and helped African-American reporters negotiate thorny societal complications associated with the trial. Clark held not only a special ranking in the newsroom, but he also was a man of honor and dignity. He was the epitome of a newspaper reporter;: hat, coat, tie, fearless, and a pipe constantly clinched and puffing thick clouds of smoke. His pipe of choice was a hefty Tracy Mincer pot. He was rarely seen without that pipe. Those were the days when newsrooms were filled with cigarette, cigar, and pipe smoke. I also had a newspaper pal who chewed plug tobacco. One day, Clark walked over to my desk and placed the Mincer pot down in front of my keyboard. "What’s this?" I asked Clark. "It’s yours. My doctor has told me I have to quit smoking. I can’t keep this pipe, or I’ll smoke it. You take good care of it." He turned and walked away, out of the newsroom that day. I didn’t know what to say at the time. A day later, I walked over to Clark’s desk and offered to pay for the pipe as my thanks. That suggestion seemed to hurt his feelings. "Don’t worry about the pipe" I quickly recovered, fearing Clark might become upset and take back the pipe. The crusty old reporter just looked at me. "Take good care of it," is all he said. I, of course, still have the Tracy Mincer pipe, rubbed smooth by years of smoking. Even some of the "gouges," familiar on a Mincer bowl or shank are almost smoothed away. To be perfectly honest about this pipe, I didn’t bother to clean it. The day Clark gave it to me, I packed it, lit it up and smoked it just as Clark had left it. I figured if he had anything catching, it would be good for me. See, Clark was one of the first Niemann Fellows at Harvard, a high honor for a reporter. Much later, I earned a year-long fellowship for journalists at the University of Michigan, which I attributed to Clark and the Mincer pipe. 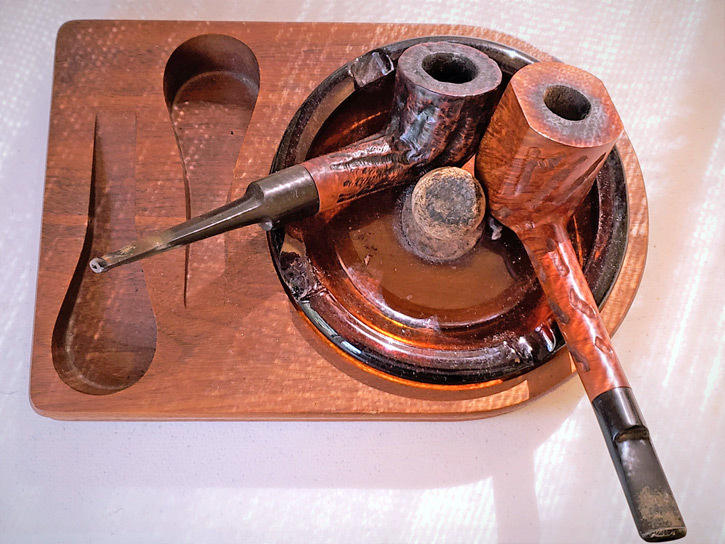 In 2014 the North American Society of Pipe Collectors (NASPC) decided to have a "very special pipe" of the year. They named it the "CustomBill," and asked master pipe maker Rich Lewis of Minneapolis, Minn., to construct a Mincer-like Custom-Bilt in honor of Bill Unger, the magazine’s longtime secretary/treasurer and editor, who died Jan. 1, 2013, of complications of Leukemia. I met Bill in Richmond, Va., at the Conclave of Richmond Pipe Smokers (C.O.R.P.S.) in 2012 (if I’m off on the date, it’s because of a fading memory). Bill was sitting by himself at the NASPC table. He asked if I was a member of the NASPC and proceeded to tell me all the reasons I should sign up. I did. I, like many of you, enjoy the quarterly very much. In 2014, I saw that there would be a "CustomBill" created of only 25 pipes in Bill’s honor. I must have put off purchasing the pipe because I noted later that the "Bills" were selling out. I called the quarterly and talked to Jeff Knoll about purchasing a "CustomBill". Turns out, Knoll said, the demand was so great, Rich Lewis, was going to add a couple more than the original 25. All 28 "Bills" sold out. I got in just under the wire. I cherish that pipe and have dedicated it to Bill’s favorite tobacco, the now gone and lamented McClelland 2015 blend. I hope someone creates a match to that luscious Virginia and perique tobacco, since I am running out of the blend safely stashed in my cellar. I have not decided what to do if a tobacco match is not found for the blend. But, I won’t smoke anything but a Va/per in it, regardless. As for my Clark Porteous pipe, it gets just about everything thrown at it. Clark wasn’t too particular, just whatever was available. Both pipes are treasures beyond their creations. They hold many memories for me and will be with me until it is time to entrust them to another pipe smoker. The tale of two pipes is not altogether about pipes but harnesses a larger power: friendship. This cadre of companions is the beating heart of pipe smokers. It is the center of their soul, a conduit to something greater than themselves. What an amazing story. Sadly, it is harder to find pipe friendship like this at work. I place a pipe on a stand at my desk every day, but I am the lone pipe smoker here. 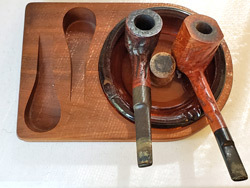 It still makes many conversations with non-pipe smokers who are interested in this tradition from an intellectual perspective, but I know they are not going to take up the pipe.